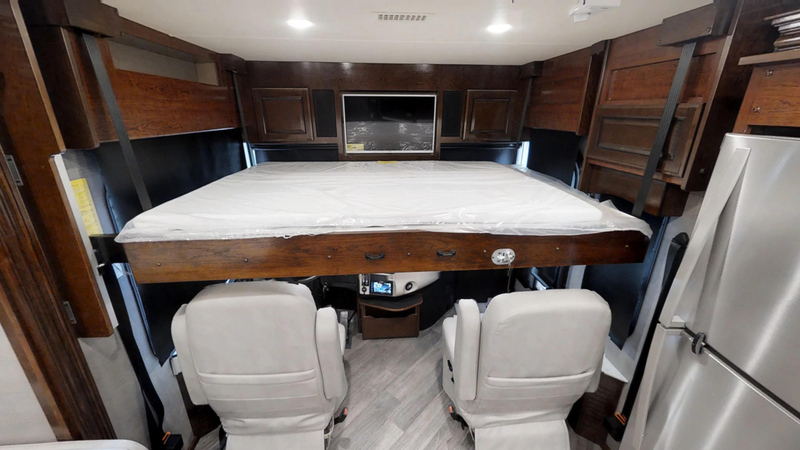 With additional luxury amenities and the exciting new 38N floorplan, the New Discovery will surprise and delight discerning RVers. The 2018 Discovery is the first diesel motorhome in its class that includes Aqua-hot® and tile shower standard. Beautifully designed and built and inspired by residential luxuries, Discovery combines an 84” interior ceiling height with the galley’s polished solid-surface countertops, hardwood cabinet doors and drawers, central vacuum and a 22 cu. ft. residential refrigerator. An innovative Firefly Integrations control panel and a powerful 340HP Cummins Engine are standard (360HP option available). This Class A diesel system features the industry’s largest pass-thru chassis storage, thanks to Fleetwood’s ingenious raised-frame design. Plus, this design accommodates oversized heated and enclosed holding tanks, while the chassis itself is engineered to deliver optimal handling. 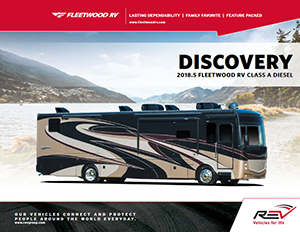 The Fleetwood Discovery includes the RV OWNERCARE warranty, a limited one-year/15,000-mile coach warranty and three-year/45,000-mile structural warranty, whichever occurs first, and fully transferable for the first 12 months. This is one of the RV industry's most comprehensive RV warranty programs.